We have hit capacity for table seating. Thank you to everyone who has bought tickets! We may have bar seating available the day of. Thank you! Plan to spend Saturday, Feb 16th, with us at the Tavern! 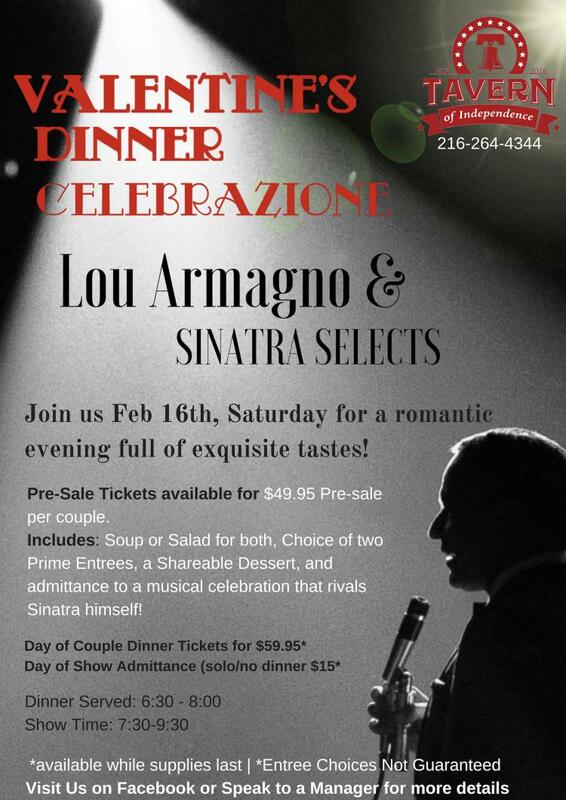 We will have live entertainment from Lou Armagno and the Sinatra Selects paired with (2) high end dinners, soup or salad for each person and a shareable dessert for two for only $49.95! - Enjoy the event, without purchase of meals at a $15 per person cover. Tickets will be required for this event for both bar and restaurant. At 9:30, the bar and restaurant will re-open to the public. Please follow the "website" link, located above to the right-below store location, for all event details and menu. We would like to stress "We will recommend you decide on entrees and dessert prior to the event. Please email - gmanager@tavernofindy.com with order to secure the proper meals for your date." Thank you! Chicken Pomodoro - Seasoned Grilled Chicken breast over a Linguine pasta tossed in home made tomato pesto with red peppers, onions, and chunks of bacon.